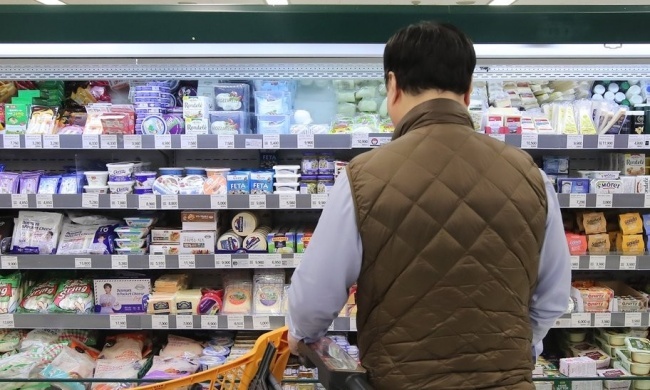 South Korea's consumer price growth continued to stay above 1 percent in June on a rise of agricultural goods and the service sector, government data showed Tuesday. The country's consumer price index climbed 1.5 percent last month from a year earlier, the same pace from the previous month's 1.5 percent on-year gain, according to the data compiled by Statistics Korea. The June figure is well below the Bank of Korea's target of 2 percent for the year, stoking speculation that the central bank's monetary tightening may be pushed forward at a gradual pace in the coming months. Prices of agricultural goods rose 1.8 percent on-year last month, compared with a 2.7 percent on-year gain tallied for May, with those for industrial goods increasing 1.8 percent from the year before, compared with a 2.7 percent on-year rise reported for the previous month, the agency said. The statistical office said prices of service charges advanced 1.6 percent last month, vis-a-vis a 1.7 percent on-year increase in May. "The gain in prices of agricultural goods slowed down last month, but a rise in global oil prices helped jack up prices of industrial goods," an agency official said. From a month earlier, the index declined 0.2 percent.